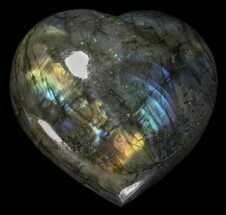 Beautiful, hearts made of polished Labradorite from Madagascar. 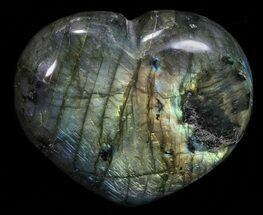 Labradorite is a feldspar mineral that is most often found in mafic igneous rocks. Some specimens of labradorite exhibit what is called a "schiller effect", which is a strong play of iridescent blue, green, red, orange, and yellow colors. 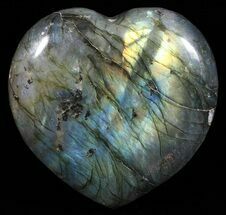 Labradorite is so well known for these spectacular displays of color that the phenomenon is known as "labradorescence." 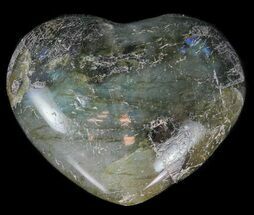 Polishing Labradorite makes this labradorescence much more prominent.